Beach top notch. Elevator not always working. Only one exterior stairs would let us in. Coffee stand needs more help and more food options. It was probably par for course for Aruba, but not even in the running for Mexican resorts. Cozumel, PV and Mazatlan are all far better than Aruba. My experience at holiday in was not bad. There were some positives and some negatives. It’s location is very prime. On the beach and walking distance to major restaurants and shops. Condition of hotel is that it’s old and rooms are outdated. Not a 4 star hotel according to me. Our trip was fun and my kids had fun. Lots to offer at a reasonable price. Location to restaurants was fantastic. It was close to the beach and the staff was very nice and price was great. WiFi not so good. close to many restaurants within walking distance. The best part about the Holiday Inn Resort Aruba was the layout of the pools and the location in relation to the beach and shopping district. The worst part about the property was the quality of the food and all inclusive drink selection. Loved being right on the beach. Everyone was extra friendly and helpful. Getting registered was slow and our room wasn't ready till 6 PM which was a little frustrating after a long travel day. The beach was great, everything is very accessible from the hotel. This was nice for the price! We brought our children with us and found it unnecessary to have a fancy hotel with them. Our boys which are teenagers enjoyed the hotel especially since it was so close to the ocean and had two pools. That said the facility needs some updating rooms are becoming outdated.Overall we would definitely come back to this property to stay again with our boys as it perfectly suited our needs. Holiday Inn Resort Aruba - Beach Resort and Casino places you next to Palm Beach and within a mile (2 km) of other popular attractions like Butterfly Farm. This 590-room, 4-star resort welcomes business and leisure travelers with 3 outdoor pools, a casino, and 4 restaurants. There are ample dining options with 4 onsite restaurants, including Corals Restaurant, which has ocean views. Savor a meal from the privacy of your room with room service, or get a pick-me-up at the coffee shop/café. Buffet breakfast is offered for a fee each morning from 7 AM to 11 AM. Guests can expect to find free WiFi and 43-inch an LED TV with satellite channels. The bathroom offers hair dryers and free toiletries. Other standard amenities include a balcony, a refrigerator, and a coffee maker. 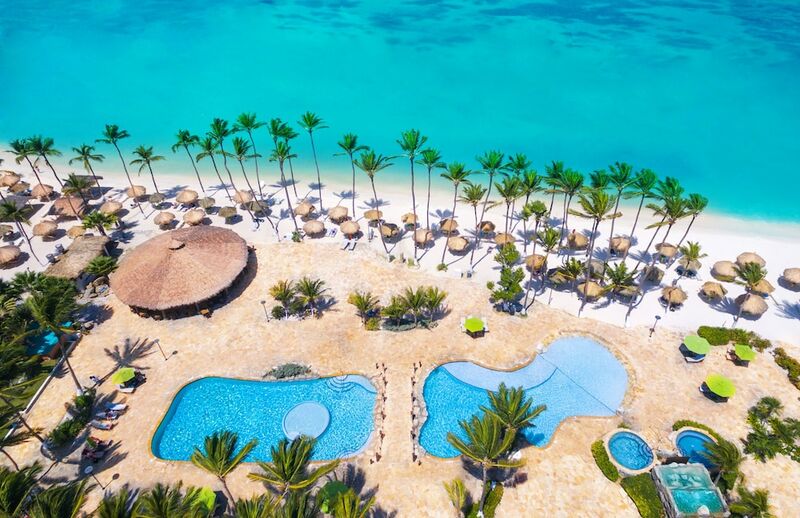 Guests of Holiday Inn Resort Aruba - Beach Resort and Casino have access to 3 outdoor pools, a casino, and a children's pool. A stay here includes free parking. The front desk has multilingual staff on hand 24/7 to help with concierge services, luggage storage, and dry cleaning/laundry. Other amenities at this beach resort include a 24-hour fitness center, outdoor tennis courts, and free WiFi in public areas. All-inclusive room rates at Holiday Inn Resort Aruba - Beach Resort and Casino are available. These rates are higher because they include onsite food and beverages in the room rate (some restrictions may apply). Corals Restaurant - Poolside restaurant open daily for breakfast. Sea Breeze Restaurant - Beachfront restaurant specializing in international cuisine. Open daily for lunch and dinner. Oceanside Bar and Grill - Beachfront restaurant specializing in American cuisine. Open daily for lunch. Da Vinci Ristorante - Restaurant specializing in Italian cuisine. Open select days for dinner. Puro Coffee - Coffee shop. Open daily. Holiday Inn Resort Aruba - Beach Resort and Casino features outdoor tennis courts and complimentary bicycles. The resort has 3 outdoor swimming pools and a children's pool. Other recreation options include a 24-hour fitness center. The preferred airport is Oranjestad (AUA-Queen Beatrix Intl. ): 21-min drive, 7.5 mi/12 km.